Hey Guys! Remember that pink flamingo plant stand I made over a few weeks ago? And remember those metal yard art flowers the pink flamingo didn’t need? 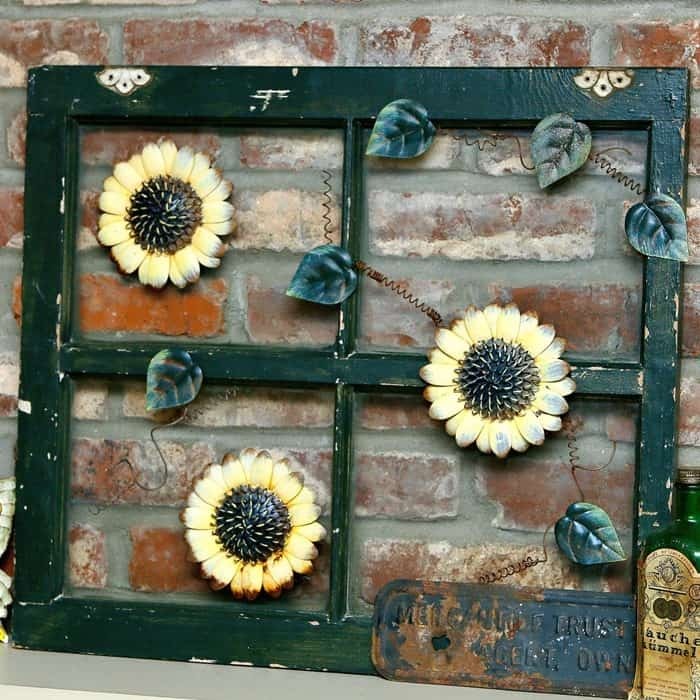 I used some of those flowers to decorate an old window. 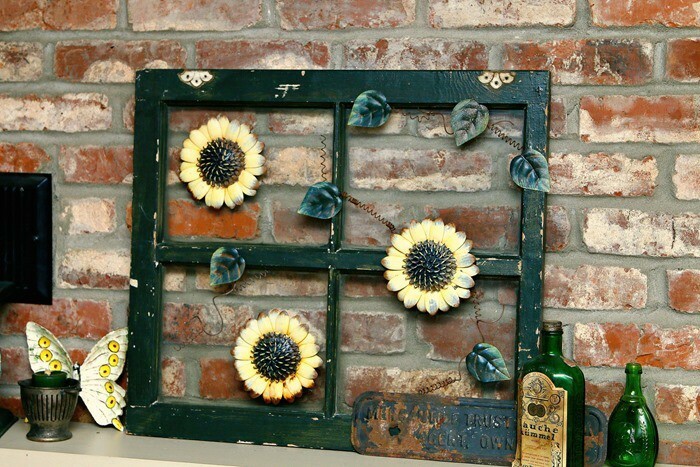 There are all kinds of ways to decorate used windows. The way I decorate them is with things I find at home. No need in going out and buying anything. 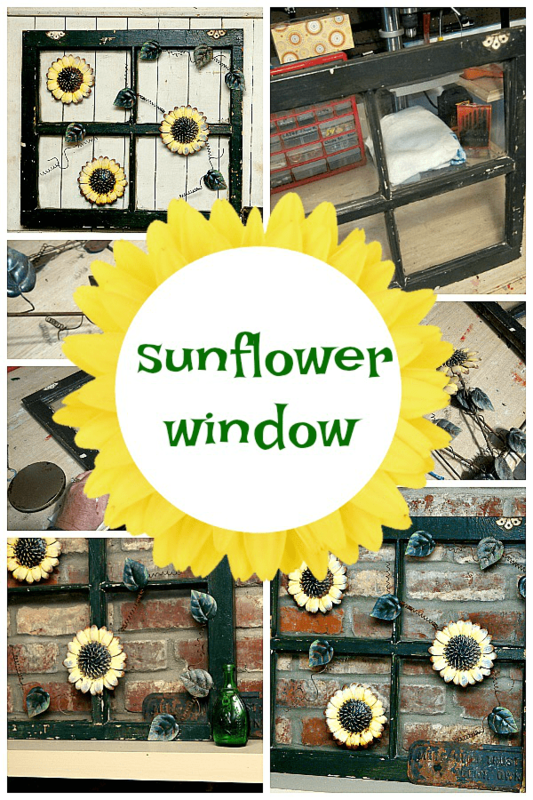 The only thing I needed besides the window and flowers was a hot glue gun and a sawtooth hanger for the back of the window. I bought the window at my favorite junk shop a while ago and don’t remember how much I paid for it. They usually run $4-$6. The window is a dark, dark, green. It’s hard to tell the true color from some of these photos because of the lighting in the workshop. And these are the discarded flowers from the pink flamingo plant stand. I was going to take them to the shop and sell them but using them in a project is always a better idea. 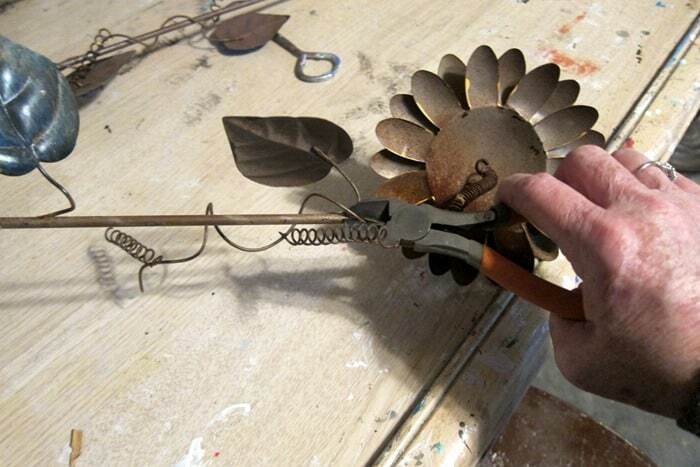 The flower stems were made of really thick metal and no way could I cut them with wire cutters. No problem. I just cut the flowers, leaves, and twirly stuff from the stems. This is what I had left to work with. I cleaned the window and gave it a coat of Howard’s Wax in Walnut. 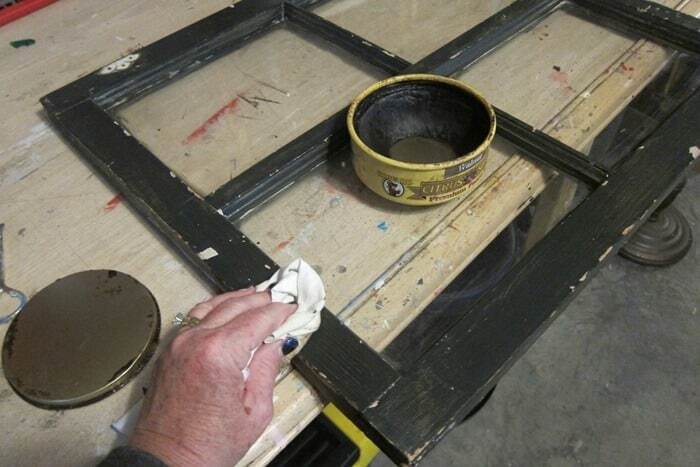 The wax protects the perfectly imperfect finish and gives the frame added patina. I used hot glue to attach the flowers and leaves to the widow and frame. 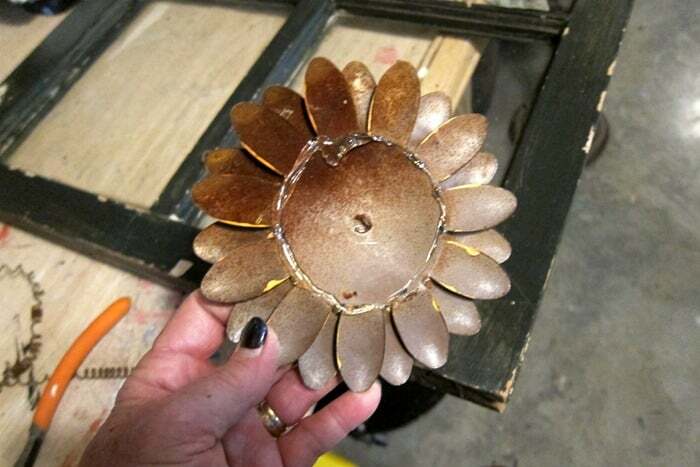 I adjusted the petals a bit pushing them up toward the front center of the flower so the back middle of the sunflower would lay flush with the window and the hot glue would have more surface to grip to. Placing the flowers and leaves in a perfectly imperfect random way that would look good was the hardest part of the project. 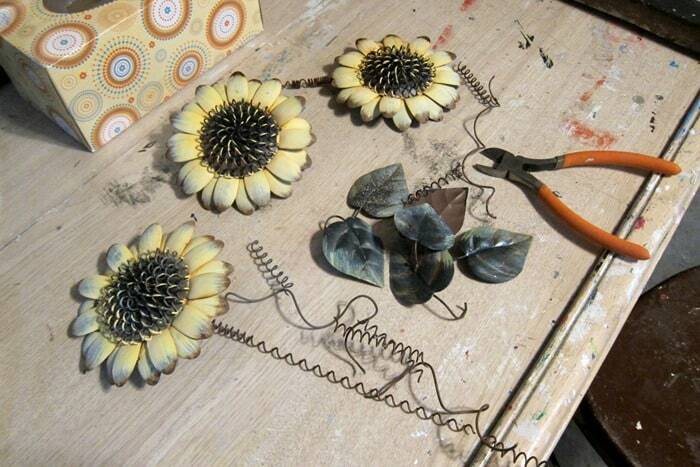 The yellow sunflowers were a bit faded and I almost touched them up. So glad I didn’t. I like the washed out looking paint. 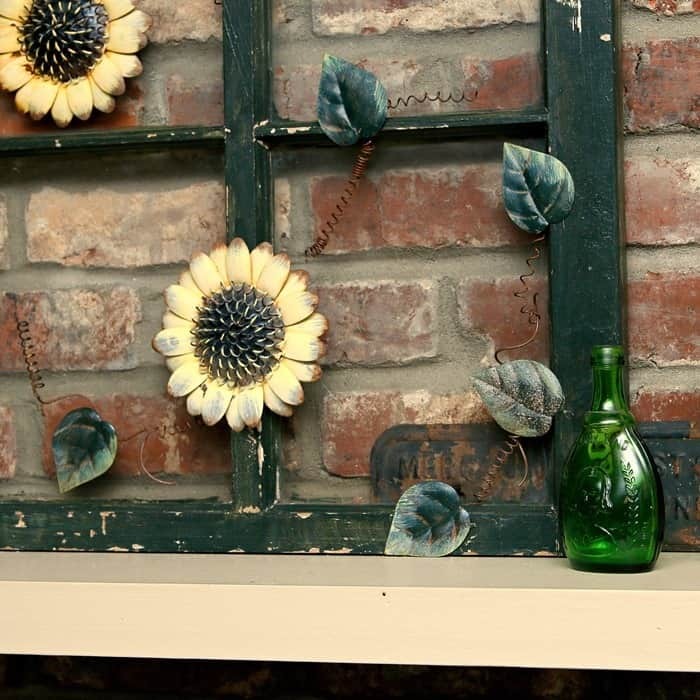 I set the sunflower window on my fireplace mantel to take photos. This piece will be going to my booth at the shop. I have two more windows to decorate. Looking for ideas. Do you have any for me? 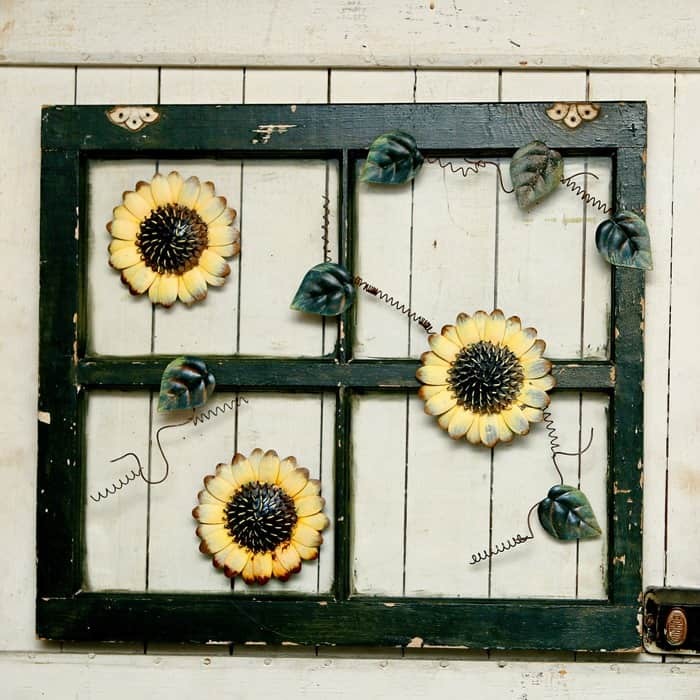 I found a project using wallpaper decoupaged to the window panes. I like that idea a lot. You can check it out here…Retro Wallpaper Window at Fave Crafts. 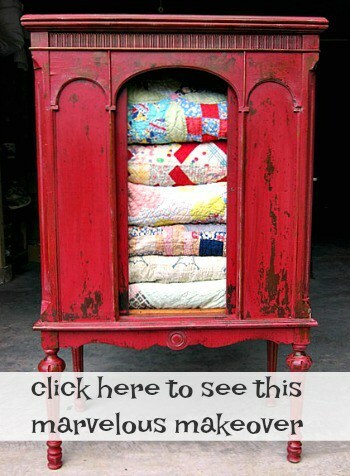 Fave Crafts is chock full of project ideas. It’s my new favorite diy crafty website. 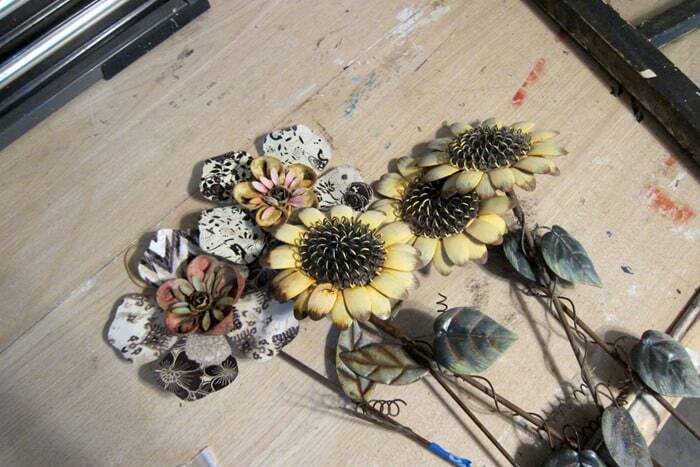 I still have two metal flowers left over from the flamingo project. I don’t have a plan for them yet. But I will. The window and flowers came out so cute. I really like it. I look forward to seeing your next projects. Great idea! I like the fade on the flowers, good that you didn’t paint them. I like this! If I had a fireplace I think it would be a great fireplace screen. 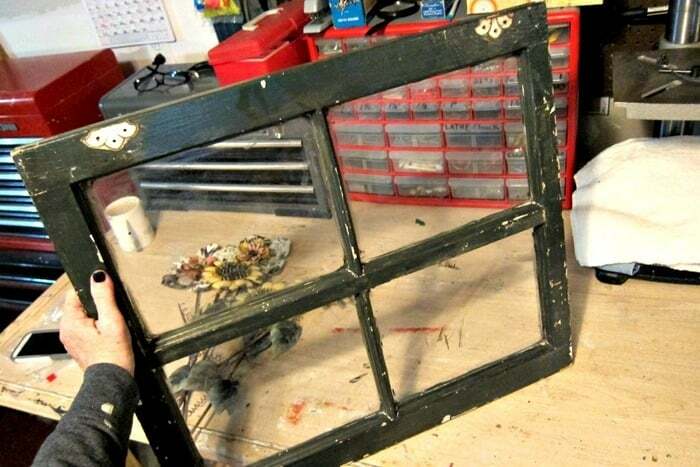 I have a couple of old windows just waiting for that special project…but a lot of the glazing? has broken off during the wait. Any tips for securing the panes of glass? I am glad you didn’t repaint the sunflowers too. 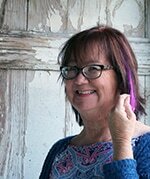 They have a kind of faded charm that feels really homely and the whole piece feels ‘homely’. I like it very much.